A podium may not have been the first thing that came to Rick Laubach’s mind when breaking the four-wide salute formation during Saturday night’s Bruce Rogers Memorial Money Maker at Grandview Speedway (Bechtelsville, PA). Jared Umbenhauer, likewise, survived some long odds. Laubach was staged 18th, winning the second consolation, with several cars ahead that had better odds and better luck befalling them up to that point. Umbenhauer had won his heat, but took 12th in the redraw. But, staying patient in a wide-open feature, Laubach drove his way to third behind winner Matt Sheppard and runner-up Jeff Strunk. Umbenhauer ranked fourth, on Laubach’s heels. “The feature was more my style,” Laubach said, explaining the longer races force a driver to exercise more patience and the skill falls back into the hands of a talented driver who had hit on a good setup. The field remained bunched together; a series of eight caution periods through the first 35 laps capped the longest runs at eight laps (lap four to 12) and seven laps (Lap 18 to 26) before the race went to the conclusion without stopping from Lap 35 through 50. The intensity of the track was gripping. There was a workable cushion, and gobs of speed to deal with. The aggressive nature of the main meant bobbles were costly, with prices paid immediately in the form of sheet metal and track position. Laubach, likewise, benefited from outside restart gains. 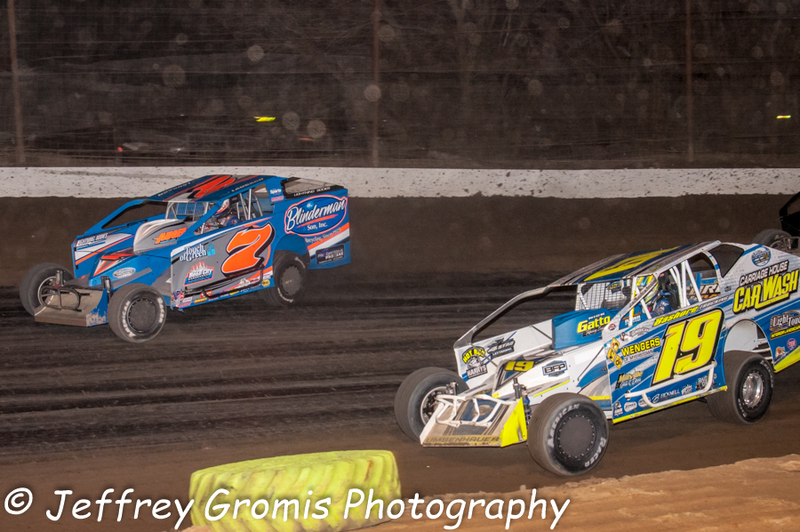 When Sheppard forged what would be the race-winning pass on lap 15, Laubach was mired just outside the top 10, battling with Ryan Watt for 11th and 12th. Umbenhauer was behind him. “We lost a few spots early, and fell back. We were mid-pack most of the race until they started falling back,” Umbenhauer said. Sheppard rocketed off a restart on lap 15, passing Danny Johnson going into the first turn. From there, he angled down off the apex to draw even with Duane Howard. He completed the pass entering the third tun as leader Brian Hirthler slowed ahead of them. As Hirthler stopped and the yellow lights came back on, Sheppard found himself at the point; a position he would not relinquish. Johnson and Howard would eventually succumb to flat left rear tires, with Howard dropping off the pace on lap 35. With all this at the head of the pack, Laubach was picking away at the back of the top 10. He was 11th behind Watt after Hirthler slowed. Two laps later, Laubach restarted eighth, ahead of Doug Manmiller, Watt and Craig Von Dohren after Danny Johnson suffered a flat. Umbenhauer returned to the top 10 at that point, riding 10th behind Manmiller. By halfway, Laubach was up to sixth, having dispatched Kevin Hirthler and Umbenhauer had followed to eighth..
Slowdowns on lap 26, lap 30 and lap 35 again offered the chance to pass cars in bunches. The lap 30 restart and subsequent exchange was Umbenhauer’s most beneficial; the order shuffled in a big way when Stewart Friesen bobbled, and fell from second to sixth in the span of two laps. Umbenhauer moved to fifth as a result, and after Howard’s flat on lap 35, he was third. Laubach was up to fourth, and with eight to go, made his final pass of the night, slipping ahead of Umbenhauer. Umbenhauer said the team had not touched the car since his harrowing fire last year, and the fourth-place offered another top five finish. He has not been outside the top five in the last several starts, barring the opening week of racing where he suffered through engine woes.